Myself and my other half are on a vegetarian buzz for the month of April. We are trying to eat less meat because we are both animal lovers and we kind of baulk at the thoughts of killing animals. The minute we embarked on this venture, all my favourite cookery started cooking lovely lamb dishes for Easter. Like everything you only miss it when it’s gone. I was on the hunt for vegetarian recipes, and I came across this recipe from the Weight Watchers magazine May issue. I really liked the yogurt and feta topping. I was only short of liking the plate after eating this. Hope you enjoy. 1. Preheat the oven to gas mark 6/ 200 degrees celsius/ fan 180 degrees celsius. 2. Heat a frying pan and mist with cooking spray. Add the diced onion, pepper, garlic and chilli and saute for 6-7 minutes or until softened. 3. Stir in the spices, follwowed by the passatta and about 150ml water. Simmer gently for a few minutes, then turn off the heat and stir in the coriander. 4. Place the beans in a bowl and add about a third of the tomato sauce. Take a rectangular baking dish that will hold 4 rolled-up tortillas. 5. Place 1 tortilla in the dish and arrange a quarter of the bean mixture down the middle. Roll up and push to one end. Repeat with the other 3 tortillas and then arrange evenly in the dish. Pour the rest of the tomato sauce over the top of the tortillas. 6. Mash the feta in a bowl, then mix in the yogurt. Spread this over the top of the tomato sauce and then scatter the grated cheddar over. Bake for 30 minutes or until the top is golden and bubbling. Serve with salad. I had planned to go through the majority of the recipes in a soup cookbook that I bought but it didn’t really happen. Best made plans and all that. I was making a lot of veg soup and was a bit bored with it, so I came across this recipe in the Weight Watchers complete kitchen book. It’s not your typical tomato soup recipe as well, sometimes I find tomato soup a bit tangy but this one isn’t. I’ll definately try this one again. The other bonus is that it’s very filling, always a good thing. 1. place the onion in a large lidded saucepan with 100ml of the stock. Cover and cook for 3 minutes then add the celery and peppers. Cover again and cook for a further 5 minutes. 2. Add the cumin, chilli flakes and tomato puree and cook for 1 minute, stirring, to bring out the flavour, before adding the chopped tomatoes and the rest of the stock. Bring back to the boil and simmer for 10 minutes. 3. 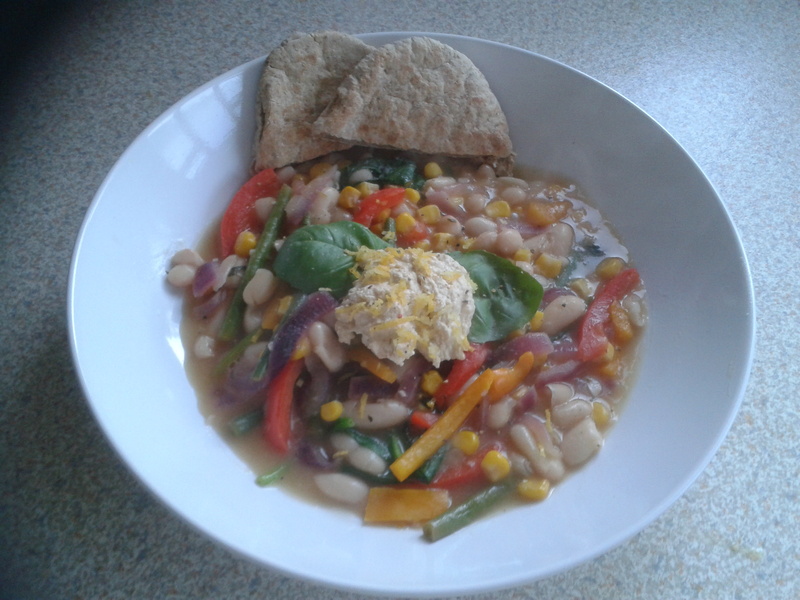 Add the kidney beans and sweetcorn to the soup and simmer for 5 minutes. Mix in the lime juice and serve the soup scattered with the coriander. Note: I’m not a big fan of celery so I left that out and used courgette instead. Also, I used a fresh chilli instead of the flakes. I threw in some chopped garlic as well. I love Mexican food, put a plate of nachos in front of me and I inhale them so I was delighted when I saw a healthyish option for nachos. I got the recipe from a Weight Watchers magazine. Needless to say I devoured them. Hope you enjoy. 1. Combine the chicken and spice in a non-metallic bowl and set aside while you cook the onion and mushrooms. 2. Heat the oil in a frying pan and, when hot, add the onion and mushrooms and stir fry for 5 minutes or until softened and beginning to brown. Add the chicken and cook for 5 minutes or until browned. Stir in the tomatoes and beans, reduce the heat and cook for 5 minutes or until the chicken is cooked through. 3. Preheat the grill. Add the tortilla chips to an ovenproof dish. Spoon the tomato and chicken mixture over the chips. Sprinkle the cheese over the top and melt under the grill. I served this with green beans, carrots and baby potatoes (you will need to point the potatoes). Generally I would season the dish during the cooking process but gammon can be salty, so in this case I would season at the end. 1. Heat a large lidded saucepan and spray with the cooking spray. Add the onions and cook, stirring for 4 minutes, adding a tablespoon of water if necessary to prevent them from sticking. 2. Add the gammon and cook for another 3 minutes. Stir in the garlic and cook for a further 1 minute. 3. Add the herbs, tomatoes, beans, paprika and 100ml (3 1/2 fl oz) water and bring to the boil, stirring occasionally. Reduce the heat, and simmer, half-covered, for 10 minutes until the sauce has thickened slightly. Season to taste. 4. Serve in warm bowls.